Animal-assisted therapy with your dog can be one of the most exciting and rewarding things that you will ever do. A friend of mine worked in a veterinary office while in college as a Vet Technician. The office she worked at had a community outreach program where we took puppies from a local adoption center to nursing homes for pet therapy. She had one boxer and one golden retriever puppy along with one German Shepherd that she took every Friday. Those elderly people absolutely loved seeing these dogs. It was so nice to be able to do something that genuinely made them smile. The nursing home had patients with Dementia and Alzheimer's that did not even remember their name, but their eyes would light up as soon as you brought a puppy in the room. They would hold them, pet them, kiss them, and snuggle with them until you literally had to pull the puppy out of their arms. 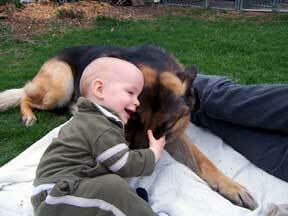 Doing this kind of therapy is what led me to get one of the German Shepherds that I previously owned. He was trained in Animal-assisted therapy classes and saw children with terminally ill conditions in a children's hospital. Although he did nothing out of the ordinary, he was a hero in my eyes. He made these children smile from ear to ear by just being there and letting them pet him. Seeing me do animal assisted therapy is what eventually led my grandmother to get a boxer and take him to therapy classes as well. He now helps her with daily tasks that she is too weak to do. He went through pretty intense training but he is so happy to help her as most working dogs are. Doing animal assisted therapy has really been one of the most rewarding things that I have done. It's so nice to know that for whatever reason, your animal has helped someone have a better life. And it's not hard to do. You can check with your local pet training groups to see who offers this level of training, but I promise you will have no problems finding it. If you're interested in having your dog enroll in pet therapy, make sure you start them out in basic obedience classes. Your pup should be able to acknowledge you and follow simple commands. Once they have mastered this skill you can move them up into a higher level of training. It is here you will learn to the techniques to teach your dog how to help people. In my case, it's as simple as having him mind with basic obedience. He doesn't do anything special. He just plays with children "easier" than he would play with a healthy adult. So it's really more of a matter of teaching him word association, which is generally not hard to do with most breeds. He genuinely loves seeing those children. Please don’t hesitate to get into this if you’re interested in it - you can find loads of information on therapy dogs online. Animal-assisted therapy is good for the community, good for your dog, and can be good for your soul.